Peptide receptor radionuclide therapy with 177lutetium (Lu)-labeled somatostatin analogs is a promising new tool in the management of patients with inoperable or metastatic neuroendocrine tumors. Some of these patients may present with carcinoid syndrome and it is known that rarely carcinoid crisis can be precipitated by surgical or other interventions in these patients. However, there are anecdotal reports of carcinoid crisis after Lu-labeled peptide therapy. We are reporting our experience of successful management of one such case of carcinoid crisis which was precipitated by Lu therapy. Carcinoid tumors are now classified as the neuroendocrine tumor (NET) by the World Health Organization. Various vasoactive peptides such as serotonin, bradykinin, and histamine secreted from these tumors are rapidly metabolized by the liver after being released into the portal circulation. In cases of hepatic metastases where peptides escape hepatic metabolism or are directly released into the systemic circulation, patients present with “Carcinoid Syndrome.” The constellation of symptoms and signs of carcinoid syndrome include diarrhea, flushing, tachycardia, bronchoconstriction, and right-sided heart failure.,, “Carcinoid Crisis” is a rare, life-threatening medical emergency involving cardiac and vasomotor instability probably due to the release of large amounts of vasoactive peptides from carcinoid tumors. Carcinoid crisis is usually precipitated after mechanical stimulation of the tumor, stress, hypercapnia, hypothermia, hypotension, hypertension, initiation of chemotherapy, or drugs that cause a release of histamine., 177lutetium (Lu)-labeled peptide receptor radionuclide therapy (PRRT) for the management of metastatic NETs has been introduced into clinical practice recently. There are anecdotal reports of such crisis after Lu therapy. Here, we report a case of a patient with metastatic bronchial carcinoid who developed carcinoid crisis after receiving Lu therapy. A 60-year-old male presented with a history of dyspnea, vomiting, fever, and skin erythema on and off for preceding 3 months to another medical center. He was a known diabetic and was taking glimepiride and metformin tablets. Contrast-enhanced computed tomography of the thorax and later of the abdomen was performed. These studies revealed a heterogeneously enhancing lesion in the upper lobe of right lung measuring 70 mm × 66 mm; and multiple hepatic and peritoneal metastases [Figure 1]. An endobronchial biopsy was performed and it was consistent with well-differentiated NET. Urinary 5-hydroxyindoleacetic acid concentration was measured and it was high (315.9 mg/24 h against normal of 2–7 mg/24 h). He was started on octreotide long-acting release (LAR). He received four such dosages of 20 mg each intramuscularly at 4 weekly intervals. Thereafter, he was referred to our institute for PRRT. An initial whole-body 99m Tc-HYNIC-TOC scan revealed increased tracer uptake in the right lung lesion and multiple sites in the liver and peritoneum. The patient was administered 200 mCi of 177 Lu DOTA-NOC infusion along with amino acid infusion. He was discharged on the next day with admissible limits of radiation. One day after discharge, he was referred to our OPD with the complaints of multiple episodes of severe vomiting, nausea, diarrhea, and shortness of breath. 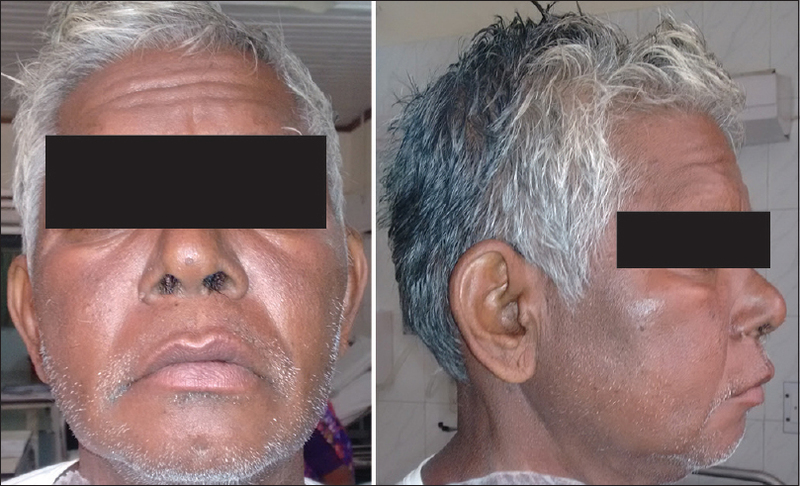 On examination, he had facial flushing, facial edema, and peripheral cyanosis [Figure 2]. His pulse rate was 110 beats/min and blood pressure was 100/70 mm Hg. Electrocardiography and echocardiography did not reveal any abnormality. He was admitted and started on injection octreotide 100 mg iv 8 hourly, injection hydrocortisone 100 mg iv 8 hourly, intravenous fluids, antiemetics, and antacids. His symptoms did not improve on the next day; hence, a dose of octreotide was increased to 6 hourly. On the 3rd day, he showed symptomatic improvement and there was no vomiting, diarrhea, and facial flushing subsided. He was discharged with advice to take injection octreotide 100 mg 8 hourly for 2 weeks and injection LAR 30 mg monthly thereafter. He was last seen on tele-follow-up 3 months following admission and did not experience any crisis during this period. We herein reported a rare case of carcinoid crisis following Lu therapy.177 Lu DOTA-NOC therapy is dependent on high density of somatostatin receptors and hence increased uptake of somatostatin analogues (SSA) by NET cells. Thus, by linking a radioactive isotope (111 Indium,90 Yttrium, or 177 Lu) to an SSA, NET cells may be specifically targeted. Lu-labeled peptide therapy is generally well tolerated. Most common side effects reported after Lu-labeled PRRT include acute gastrointestinal side effects occurring within 24 h and subacute hematological toxicity 4–8 weeks after treatment. Other delayed or less common side effects reported are renal toxicity, liver toxicity, and myelodysplastic syndrome. In the English literature, only de Keizer et al. have reported carcinoid crises following PRRT (177 Lu-DOTA0, Tyr3 octreotate) in patients with NETs. Six patients (1%) among 479 cases having 1693 administrations of PRRT developed carcinoid crisis after administration of 177 Lu-octreotate. Among these, three patients had carcinoids (one each bronchial and intestinal), two had pancreatic VIPomas, and one had metastatic pheochromocytoma. Similar to our patients, all recovered with adequate treatment. Several mechanisms have been postulated for the induction of carcinoid crisis after PRRT and include tumor lysis because of beta irradiation from 177 Lu, discontinuation of SSA prior to therapy, emotional stress response to hospitalization and/or therapy; and administration of amino acids with therapy. However, exact mechanism is yet to be elucidated, as there are only few reported cases in the literature. Although well tolerated,177 Lu PRRT may trigger carcinoid crisis, and clinicians need to be aware of this fact. Modlin IM, Shapiro MD, Kidd M. Siegfried oberndorfer: Origins and perspectives of carcinoid tumors. Hum Pathol 2004;35:1440-51. Gustafsson BI, Kidd M, Modlin IM. Neuroendocrine tumors of the diffuse neuroendocrine system. Curr Opin Oncol 2008;20:1-12. Grahame-Smith DG. The carcinoid syndrome. Am J Cardiol 1968;21:376-87. Vaughan DJ, Brunner MD. Anesthesia for patients with carcinoid syndrome. Int Anesthesiol Clin 1997;35:129-42. Mehta AC, Rafanan AL, Bulkley R, Walsh M, DeBoer GE. Coronary spasm and cardiac arrest from carcinoid crisis during laser bronchoscopy. Chest 1999;115:598-600. Kam BL, Teunissen JJ, Krenning EP, de Herder WW, Khan S, van Vliet EI, et al. Lutetium-labelled peptides for therapy of neuroendocrine tumours. Eur J Nucl Med Mol Imaging 2012;39 Suppl 1:S103-12. de Keizer B, van Aken MO, Feelders RA, de Herder WW, Kam BL, van Essen M, et al. Hormonal crises following receptor radionuclide therapy with the radiolabeled somatostatin analogue [177Lu-DOTA0, Tyr3]octreotate. Eur J Nucl Med Mol Imaging 2008;35:749-55. Hughes EW, Hodkinson BP. Carcinoid syndrome: The combined use of ketanserin and octreotide in the management of an acute crisis during anaesthesia. Anaesth Intensive Care 1989;17:367-70. Teunissen JJ, Kwekkeboom DJ, Valkema R, Krenning EP. Nuclear medicine techniques for the imaging and treatment of neuroendocrine tumours. Endocr Relat Cancer 2011;18 Suppl 1:S27-51. Bombardieri E, Ambrosini V, Aktolun C, Baum RP, Bishof-Delaloye A, Del Vecchio S, et al. 111In-pentetreotide scintigraphy: Procedure guidelines for tumour imaging. Eur J Nucl Med Mol Imaging 2010;37:1441-8.